Little foot, the controversial and almost-complete skeleton of an ancient human ancestor, walked more like a chimp than a human. Scientists made the discovery after completing detailed scans of her inner ear. Previous analysis has found the four-foot tall Little Foot lived 3.67 million years ago and was an entirely different species than anything we have ever seen before. They have also discovered she is an elderly female with a crippled left arm, legs longer than her arms and had an exclusively plant-based diet. Analysis of her skull allowed scientists to build a complex 3D computer model of her inner ear. This region contains several small bones and organs which are involved in balance and locomotion. Researchers from the University of the Witwatersrand found this ‘bony labyrinth’ is ‘substantially different’ from other early species of human. This paper adds to a growing body of research which says that Lucy walked on two feet but also spent considerable time in trees. 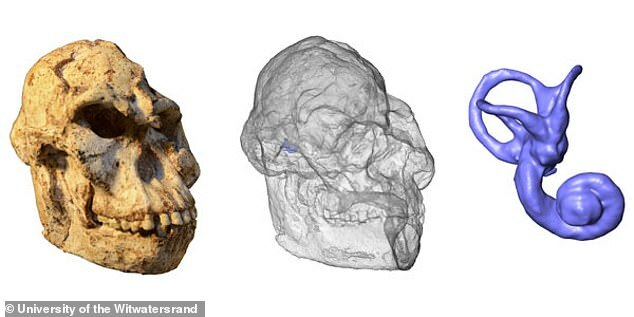 Scans of her cranium were compared to 17 early hominin specimens which included 10 extant humans and 10 chimpanzees. Scientists found Little Foot’s canals were distinctly ‘ape-like’ and bore a striking resemblance to those of chimpanzees. 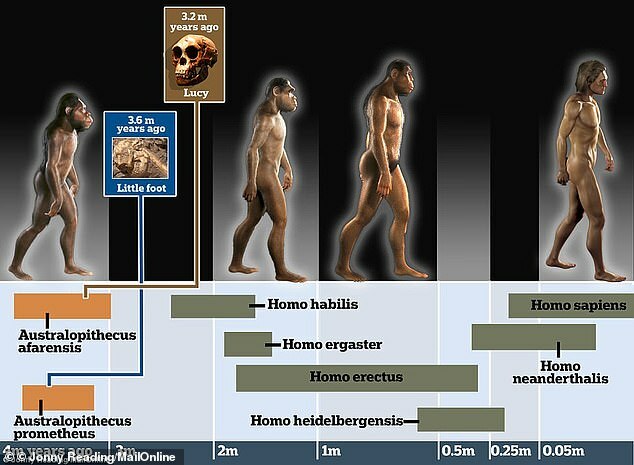 ‘Our analysis of the inner ear might be compatible with the hypothesis that Little Foot and the Australopithecus specimens in general were walking on two legs on the ground but also spent some times in the trees,’ says Dr Amélie Beaudet who published the research alongside Professor Ronald Clarke in the Journal of Human Evolution. The cochlea, an organ deep within the inner ear which resembles a snail’s shell, was also significantly different to that in Homo sapiens. ‘This organ is related to sound perception and to ecological factors such as diet, habitat or communication,’ Dr Beaudet said in the statement. 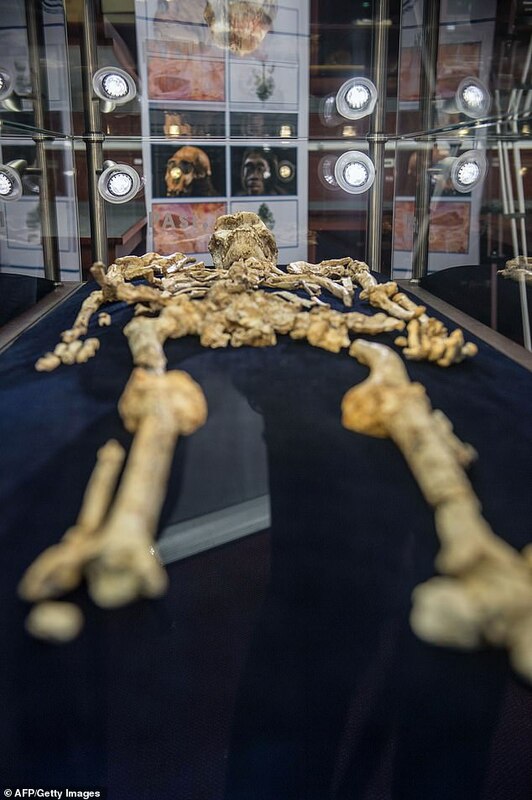 The skeleton was first discovered in the 90s in South Africa and was first categorised as Australopithecus, a group of hominins to which the famous fossil ‘Lucy’ belongs. 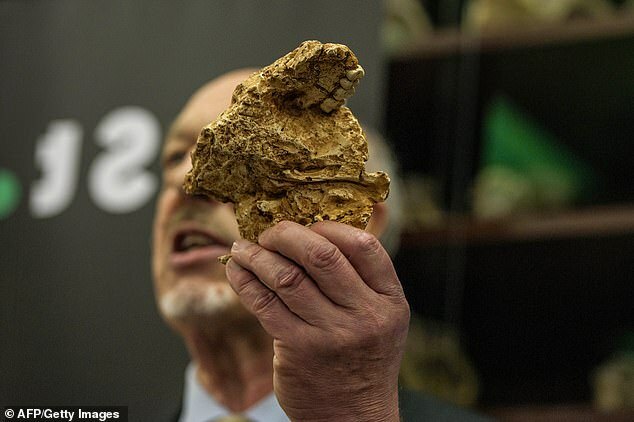 Dr Ronald Clarke of the University of the Witwatersrand in Johannesburg has claimed for two decades that this is incorrect and Little Foot does not belong to any known species. In 2015, a team used Purdue’s PRIME Lab’s powerful accelerator mass spectrometer and a new detector, called a gas-filled magnet detector, to measure the radioisotopes. The gas-filled magnet creates a different charge on the two radioisotopes and throws the magnesium-26 on a different path with a curvature that misses the detector. This lowers the magnesium ratio and increases the aluminum-26 count in the sample that makes it to the detector, which results in a much smaller margin of error in the measurement. The gas-filled magnet detector was originally to be used to analyze samples of solar wind collected by the Genesis spacecraft. Unfortunately, the space capsule carrying the samples crashed in 2004 on its return to Earth. The crash delayed analysis of the Genesis samples, but Caffee continued to build the detector and it was completed the summer of 2014. Caffee has since used it to perform analysis for other projects, including those from the Sterkfontein site. ‘Only a few detectors of this kind exist in the world,’ Caffee said. He claims she is a member of a new species, which he calls A. prometheus – a grandiose name stemming from the Greek titan Prometheus who crafted mankind from clay. He used an air scribe to painstakingly remove the remains without the fragile bones flaking away. 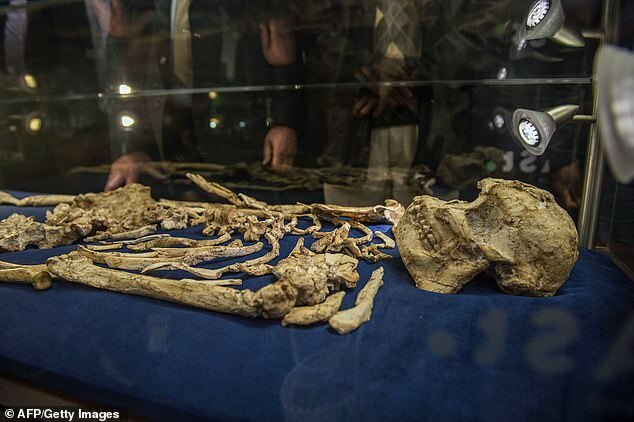 The remains of Little Foot were first found in the Sterkfontein caves near Johannesburg in 1994. 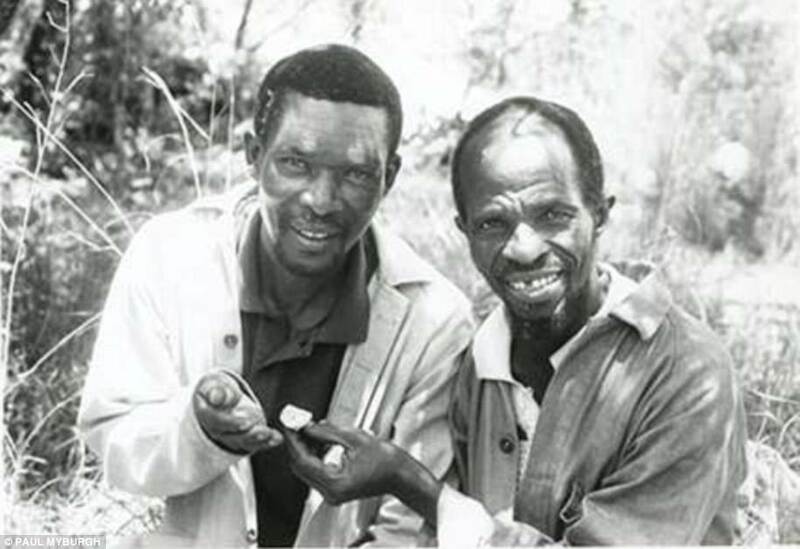 The affectionate nickname for the fossil, formally known as StW 573, was obtained when a scientist used the term to describe the petite bones compared to the larger hominins known to exist at that time.